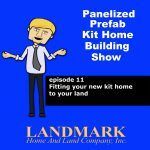 Episode 11: On this episode, Landmark Home and Land Company reviews sorting out if your land and proposed build site are “buildable” and suited to your new home project. Building setbacks, Home Owners Associations, soil tests for septic system and geotechnical reports, height restrictions and topography. Episode 10: More of the best questions answered! Windows and rough openings for a panelized home. Delivery and details of individual wall panels and roof trusses. Assembly of your new panelized home package. Limited building seasons and how panelized home kits can help you. Is a panelized home like a stick built home? Episode 9: Interesting and common questions. Benefits of different foundation types. Designing your kitchen and bathrooms. How are panelized home kits priced. Energy calculations and building permits. Lot coverage and setbacks. Siding for my custom panelized home. Episode 8: Common questions answered. What is a panelized home and how does it compare to stick built, modular, prefab and prefabricated homes? Customization capabilities of Landmark’s panelized homes and what is included. Selecting a foundation type and assembling your panelized home kit. How do I know windows will fit? Episode 7: Ideas on how to develop the plans for your new home project. Can you draw your own up or should we help you? How do I know plans are good for permits? Will they be usable to build my new home? What if I want to customize a standard or online plan? Working with building departments. Do I need an Architect to design and build my own home? Fitting your new home on your lot. How does a Structural Engineer help. Episode 6: Benefits of being an Owner Builder and the support you may need. 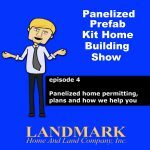 How Landmark’s services and panelized homes help with your design, budget, control of the project and quality and pride of ownership. Building what you want and not being limited by standard plans. Understanding your new home project and getting the right help. Episode 5: Structural engineering and its benefits for the intended use of the home and the building site. What is done in the structural engineering processes? Can I put a grand piano in my bedroom? Why do homes sink and sag and how to avoid this in your new home. Episode 4: Permitting and building departments. Working with tough building departments. How to obtain permits when codes are changing and tightening up. Design and code impact when building in different building conditions. The value of unified plan sets where all the information is uniform and matches. Green and energy codes and sun analysis to make your home more comfortable and enjoyable. Episode 3: Planning and designing your new home is the most important step. Where to start. Are standard plans or online plans usable? Can my friend design the plans? Fitting the home to your building site. Taking our conceptual ideas and getting them into usable plans. Benefits of a one stop shop for plans, engineering, energy codes, and site plans. How proper plans help your project, permitting and budgeting. Episode 2: Building your new home is exciting and it all starts with the initial design ideas. We discuss preliminary architectural design to fit your family’s needs and lifestyle. How different building sites and geographic locations affect your home's design.